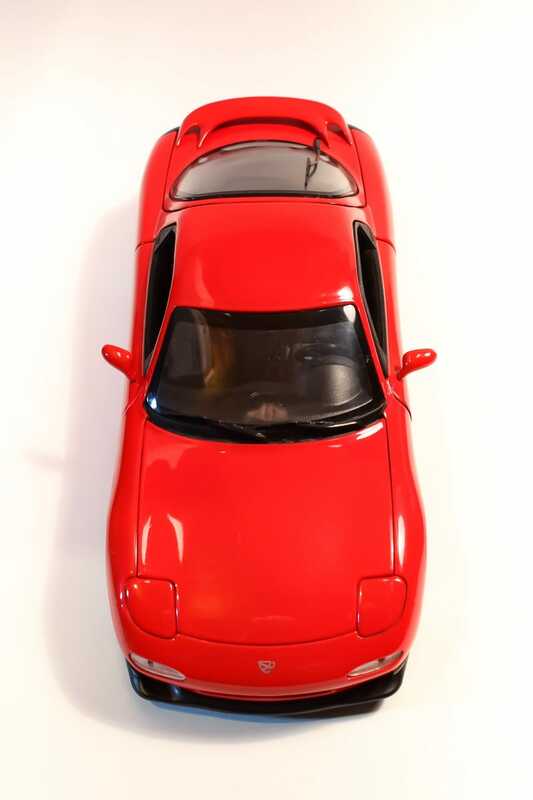 There are several variations of the RX7 made by Kyosho. Most of these on eBay command grail status and prices. This one popped up without a box and to my surprise, I only had to bid against one other person. I won, and my excitement was quickly replaced with anxiety. Why hadn’t anyone else bid? What did I do?! Did I steal this at $71? Let’s check out this model, shall we? To be honest, I was disappointed when this model showed up at my door. There, I said it. As LaLD’s self proclaimed head cheerleader for the Kyosho brand, I had high expectations. My 037, Miura Jota, and Ferrari Daytona set the bar high. Like really high. If you had told me this was a Maisto with carpet, I would have believed you. Not that Maistos are bad, I love Maistos, but they’ve got that budget feel, you know? I’m not sure if this is the hood prop this model was born with. See the hook on the left? The prop doesn’t reach that far across, only like 3/4 of the way. I’m also not too happy that the side indicators are paint. The doors don’t stay shut, unless I close them just right. They don’t latch shut and there’s not enough friction to hold them there. This could have been caused by the model’s last owner, but I’m not sure. Ok, I’ll stop complaining now and focus on the good stuff. Let’s start at the back. I love the rear defroster detail! The rear hatch opens up to reveal a tonneau cover over a carpeted luggage compartment. The interior lives up to the Kyosho hype. The FD never had the fanciest cockpit to begin with, but this model does it justice. There’s individual gauges in the dash, the pedals are desperate prices, and of course, carpet! The engine bay details that legendary wankel/time bomb. I love the strut tower support! Paint details the intake and the alternator up front. You can see those lens posts from space. I’ve tested it. One last interesting tidbit: This model is branded as Efini. Mazda at one point sported three different brands in addition to themselves. The Eunos brand had the luxury cars, Efini had the sports cars, and we all know what Autozam had. These three brands were exclusive to the Japanese market. This model is left-hand drive. Weird, right? I either missed something or Kyosho slipped up. I probably missed something. Ok I’ll shut up now. The design of the FD is simply gorgeous. Kyosho could have made this model out of styrofoam for all I care and it still would have been beautiful. All the nitpicking I did really doesn’t matter to me. There was no way I was dropping basically a car payment on a new in box RX7. Did I steal it? No. I think I paid a fair price. Am I happy with it? You bet.